As an accomplished decorating partnership, our high level of scrutiny and attention to detail produces an outstanding finish. Painting is a quintessential example of the adage, failure to prepare is preparation for failure. Excellent surface preparation is fundamental to achieving a beautiful and long-lasting finish. For an average sized room we will typically dedicate our first day entirely to the preparation of walls, ceilings, woodwork and other surfaces; sanding, filling, stain treatment and undercoating ensure an optimum base upon which to build a superior finish. 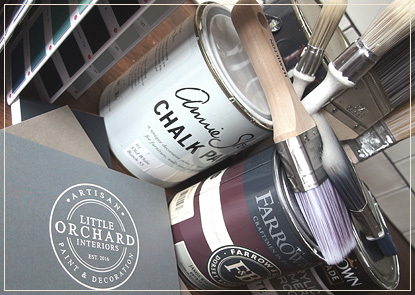 We will always discuss and advise on the most suitable products for your project and over time we have identified a range of quality trade paints whose higher pigment contents accomplish superior coverage. We are also equally happy to source any preferred brands and colours of your choice, that fit your project requirements. With a wealth of experience working on all types of property, from period homes to conversions and new builds, we are confident that our meticulous work process will meet the highest expectations.